Offences including public provocation to commit a terrorism and recruitment for terrorist activities will carry sentences of up to 10 years in prison. 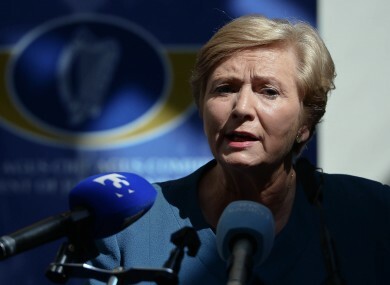 JUSTICE MINISTER FRANCES Fitzgerald has published a new Criminal Justice amendment Bill which will introduce three new terrorism offences to the Irish statute book when enacted. The Bill transposes an EU Council Framework on tackling terrorism into Irish law and will see three new offences creates under the Criminal Justice (Terrorist) Offences Act 2005. The ‘public provocation’ offence concerns the distribution of messages with the intention of encouraging either directly or indirectly the commission of terrorist activity, and anyone convicted of the offence is liable to a fine of up to €5,000 as well as a prison sentence. ‘Recruitment for terrorism’ concerns the recruitment or attempted recruitment of persons to engage in offences detained under Section 6 of the Offences Against the State Act 1998, Section 21 or 21A of the Offences Against the State Act 1939, or Section 3 of the Criminal Law Act 1976. The three offences reflect similar offences covered by the Council of Europe Convention on the Prevention of Terrorism, signed by Ireland in October 2008. Publishing the new Bill today, Minister Fitzgerald said it “lays the groundwork” for Ireland’s ratification of the Council convention. “We stand with our European colleagues in doing everything in our power to ensure that there are no gaps in our law that can be exploited by those who would inflict terror and mayhem on innocent people at home or abroad,” Fitzgerald said. There can be no hiding place in democratic society for those who encourage, recruit or train others to carry out acts of terrorism and we must never relent in our determination to use all resources at our disposal to root them out. Email “New law will make it illegal to recruit or train terrorists ”. Feedback on “New law will make it illegal to recruit or train terrorists ”.